Minister for Housing Eoghan Murphy opened 44 new social housing units in Dundrum, Dublin this morning. 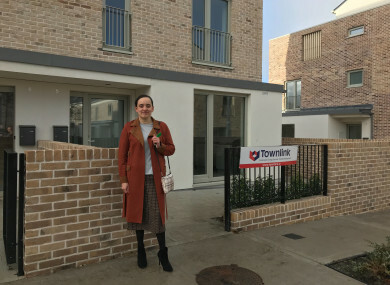 A MOTHER AND her three children who have spent the last 13 and a half years on the social housing waiting list have secured a new home in Dublin – one of 44 new social housing units delivered under Rebuilding Ireland today. The family was served with a 221-day notice of termination on their rented property in Rathfarnham in May of this year. Speaking to reporters inside her new home this morning, Maria Mieszczyk described being told that she had to leave her rented home. “The landlord needed the house for his son. His son is studying in Dublin and he wanted to move in, that’s the way it is,” she said. “It was just depressing. I was like ‘Oh my god, what’s happening?’” she said. She attempted to find a new property to rent using Housing Assistant Payment (Hap). Hap is a form of social housing support offered by local authorities, but charities have raised on numerous occasions that Hap recipients find it difficult to source accommodation. Hap recipients can get a large portion of their rent paid by the local authority. In August, a Simon Communities study found that over 90% of homes for rent in Ireland were beyond the reach of people dependent on State housing benefits. The Locked Out of the Market XI snapshot study found that just 8% of properties available on the market to rent at the time (41 properties) were within the RS and HAP limits. Mieszczyk said she feared she would have to move into emergency accommodation with her children, and called Focus Ireland, Threshold and Dun Laoghaire-Rathdown County Council for support. Since contacting the council, Mieszczyk secured one of the 44 new social homes in Dundrum. Mieszczyk has lived in rented accommodation since moving to Ireland. This will be the first time she has a home to call her own here. I have security for life. For myself and the children, you know. There will be nobody knocking at the door and saying ‘Sorry, but you have to move out, I’m selling the house’. “When [my children] came over [to the new house] they were just shouting, they were so happy, like ‘Mum, this is a beautiful house, this is lovely’. I didn’t imagine I would get a house like this,” she said. Mieszczyk met and chatted with Minister for Housing Eoghan Murphy at the house today, as he officially launched the project. The new dwellings comprise 32 family homes and 12 apartments. Email “'I have security for life... there will be nobody knocking to say: Sorry, you have to move out'”. Feedback on “'I have security for life... there will be nobody knocking to say: Sorry, you have to move out'”.